This free literacy collection has been created to help you practice Close Reading skills with your students. 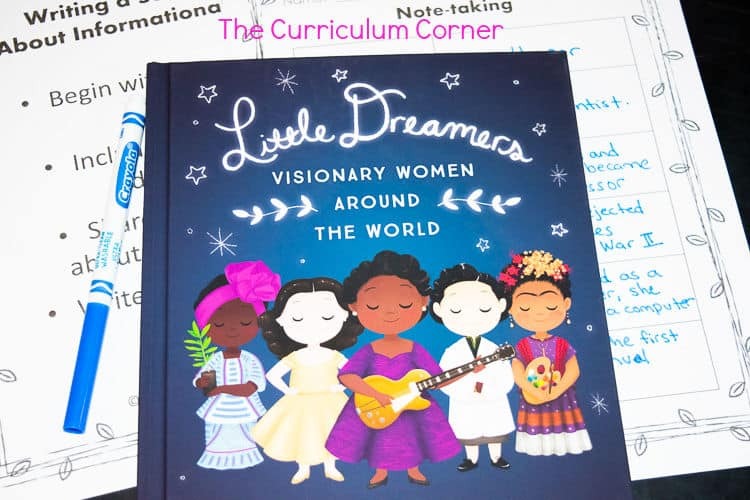 We have created this free literacy collection to help you explore the book Little Dreamers: Visionary Women Around the World. While creating this set, we have worked to create a set that will help you implement Close Reading in your classroom. 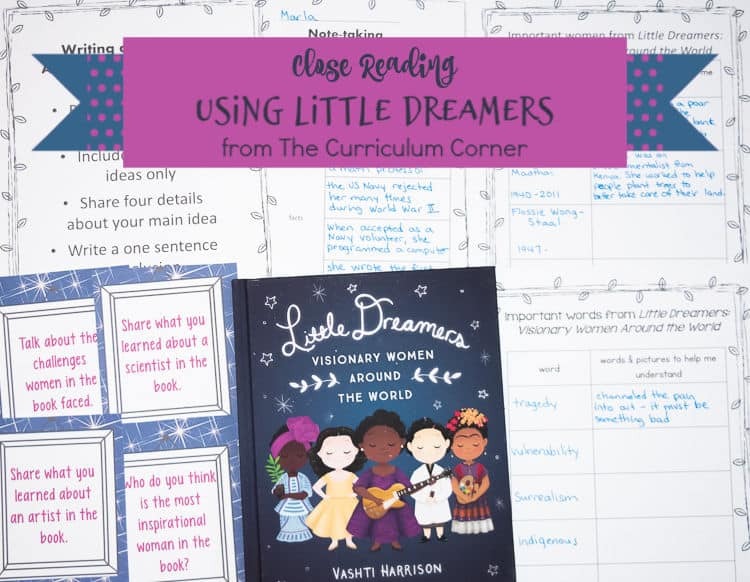 We believe that Little Dreamers is a perfect book to help you develop Close Reading skills. 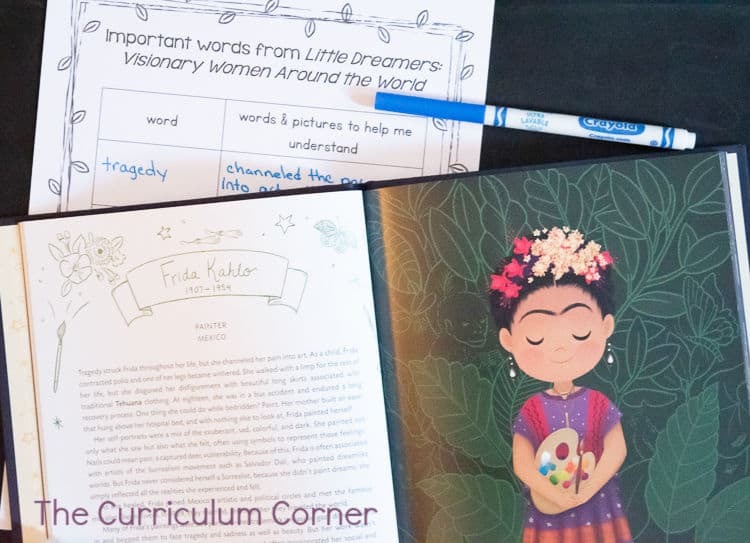 The passages are rich with new vocabulary and unique stories that most children will not have heard. Because of the variety of pages we have created, our plan is not for you to work through every page with your class. Instead, it is important for you to choose the pages that will fit needs of your classroom. It might be helpful to begin by choosing your goal for the reading of passages from the book and then choose the page or pages that will help you meet that goal. The first skill we have covered is summary writing. A black and white anchor chart is also provided – students can add this to their reading notebooks if you believe it will be a useful tool for your students. Before students are ready to write a summary, they will be asked to practice their note-taking skills. We have provided a graphic organizer to guide students in their note-taking. 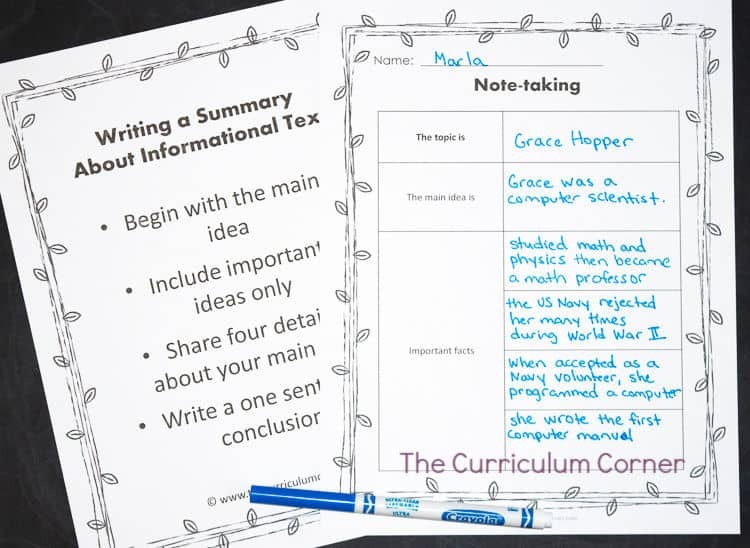 A lined paper can be used for students to write their summary. This skill is one we suggest you begin by modeling expectations. We would then practice again by completing a note-taking and summary writing page together. Once you feel like your students are ready, they can complete their own set by going through the steps independently. 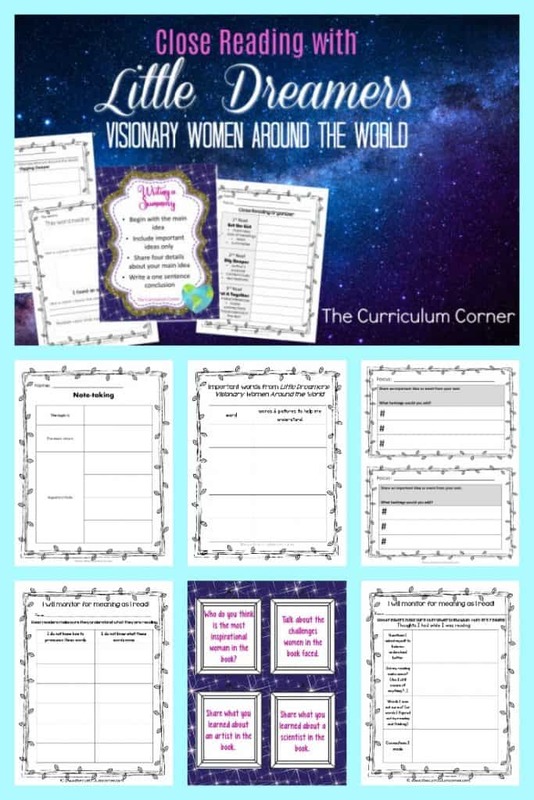 You will find a set of 12 question cards designed to get your students thinking about the reading. When used in small groups, the goal of students will be to first create a “thinking deeper” question with the prompting of a card. (Check out our post on Thick or Thin Questions to help your students learn this task. Once a student has formed a question, the remainder of the group will work to dig into the text to answer the question posed. The next graphic organizers are designed to encourage your students to practice their Close Reading skills. It is important to remember that these pages have not been created to simply give your students for independent work. Before students are able to dig into the text on their own, they will need modeling and guidance. Again, if your students are new to the process of Close Reading, take a look at our complete Close Reading collection to help them develop their reading skills. Each page has been provided with the thought that each person in the book can be the focus of a Close Reading activity. This allows you to use one passage for modeling, another for small group practice and others for independent practice. While students do not all need to work on the same focus, the tasks will be similar. A few of the pages we have created might require a little more guidance form us on the intention. Of course, you might think of your own uses that are different. # Exit Ticket This half sheet of paper is designed to be a quick check-in with students. They will choose a focus and write a sentence or two to tell about the person. In the three boxes below, containing hashtags, students can create their own hashtags which they think fit the person best. What I’ve Learned About This page can be used to have students explore beyond what they read in the book about a person. The boxes have been left without headings so students can create their own. 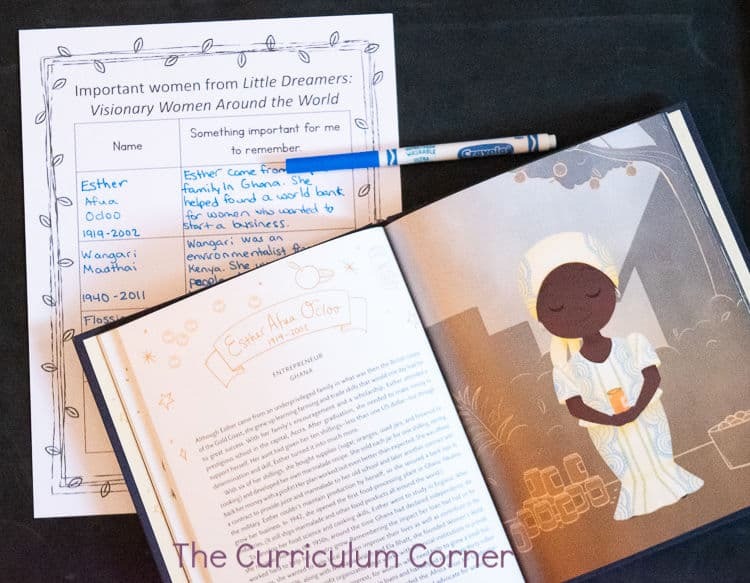 The goal is for students to create their own page for a book or poster for display that shares information about the woman they choose to focus on. New Words we have Learned This anchor chart is designed to be a place for students to add new words as they learn them. Challenge your students to share their new words with others. Cell Phone Students can create a text exchange between the woman they choose to focus on and someone who they might be texting. Or, students can choose to draw a picture that would depict something their focus might have taken a picture of. Create a Banner The shield containing four boxes can be used to create a banner in your classroom. Students can include the woman, important information and interesting facts. Encourage them to include pictures. When completed, they can cut it out and you can string the shields together to create a banner for your classroom. 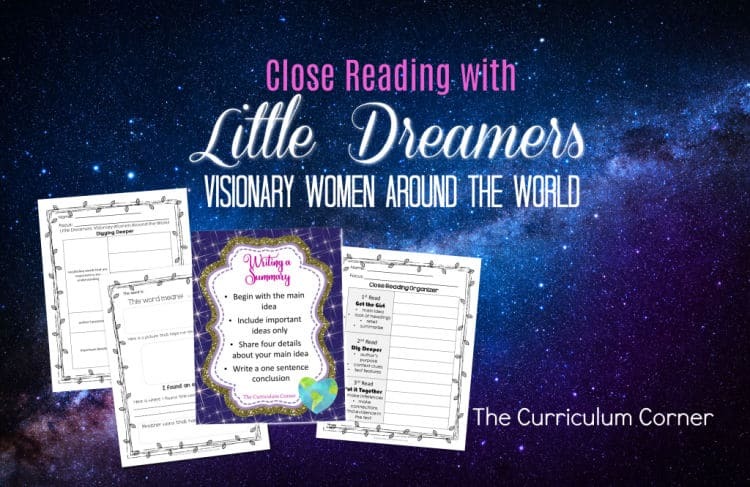 Little Dreamers Booklet Encourage your students to write their own Little Dreamers book. We have provided a blank cover page along with a lined page for students to research and share facts about people they choose to include in their own book. Along with preprogrammed pages to practice specific skills, we have also included a few blank pages that can be used as needed. You might also like the books below. The second is a board book but we like the idea of using it for a model for your writers. They could create their own version for a younger class in the school.